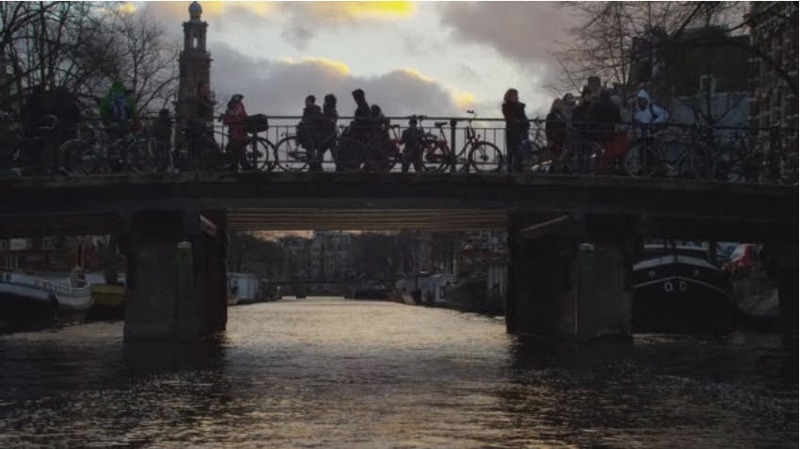 Lots of shots of Amsterdam in the Apple 30th anniversary film looking back at the Macintosh. Not that I really understand why, although we were certainly early adopters. Fascinated to discover by accident that the strikingly beautiful girl in the red shorts in the 1984 Apple commercial was British actress and athlete Anya Major. She was also played Nikita, the Russian border guard, in the Elton John video the following year. In 1983, the Chiat/Day advertising agency held a casting call in London, on behalf of their client, Apple Computer, for what would prove to be a landmark television commercial. The vision of the agency and director Ridley Scott stipulated an actress capable of running up to a large video screen, swinging a sledgehammer in a wide spin, and releasing it at the video screen. Most of the models and actresses tested could not wield the clumsy hammer, much less throw it; in fact, one errant throw nearly struck a passerby at the Hyde Park casting call. The petite Major, an experienced discus thrower who had been discovered at a local health club, won the role with her ability to handle the hammer convincingly. The commercial officially aired only twice on US television. Its best-known appearance was just after half-time of Super Bowl XVIII on January 22, 1984. It had earlier been screened in December 1983, right before the 1:00 am sign-off on KMVT in Twin Falls, Idaho, so that the advertisement could be submitted to award ceremonies for that year. In addition, starting on January 17, 1984 it was screened prior to previews in movie theaters for a few weeks. Even with these limited appearances, the ad created such a media frenzy that it gained many subsequent free TV airings and print mentions, as it was discussed in the media. Will always remember her piercing blue eyes, even though the VHS video quality was awful in those days.